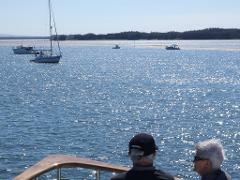 Welcome aboard our fine timber ship the “LADY BRISBANE”, for a relaxing day on the Broadwater & Moreton Bay Marine Park. Sailing days depend on tides and vary each two weeks. Buy a GIFT CARD or BOOK Online now. Return coach included. Welcome aboard our fine timber ship the “LADY BRISBANE”, for a relaxing day on the Broadwater and Moreton Bay Marine Park. Sailing days depend on tides and vary each two weeks. Buy a GIFT CARD or BOOK Online now. Return coach included. 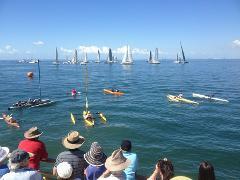 Join us on board the MV Lady Brisbane to view the start of the Brisbane to Gladstone Yacht Race. Feel the excitement near the "Official Starting Line" for this iconic Australian sporting event:- Queensland's Premier Bluewater Classic Event. Treat your Mum on Mother's Day and leave the washing up behind! Enjoy a delicious buffet lunch whilst cruising our beautiful Brisbane River, on the MV Lady Brisbane. All Mums will receive a complimentary glass of Champagne on arrival. 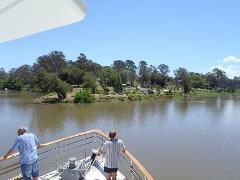 Morning or Afternoon Tea & Lunch "Explore Our River Cruise". Our fantastic 4 hour cruise is the perfect option for a group outing or a Corporate function. Please call our office, Ph 07 3630 2666 to assist with your event. River and Bay cruise to Brisbane’s best kept secret “hell hole of the south pacific”. 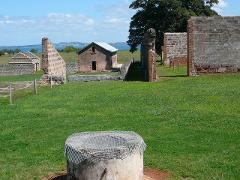 St Helena Island only 6 km SE of the Brisbane River mouth. Join us for our "St Helena Island Cruise & Guided Tour Experience including lunch"
River and Bay cruise to Brisbane’s best kept secret “hell hole of the south pacific”. St Helena Island only 6 km SE of the Brisbane River mouth. Join us for our "St Helena Island Cruise & Guided Tour Experience including morning tea"
Cruise the Brisbane River to the "Junction" of the Bremer River passing wonderful mansions, new developments, Lone Pine, Seventeen Mile Rocks, Westlake, River Hills and the Moggill Car Ferry. Buy a GIFT CARD or BOOK Online. Re-trace the extremely popular "KOOPA" trail, past the iconic Redcliffe Jetty, Deception Bay and majestic Glasshouse Mountains, to Bribie Island. Buy a GIFT CARD or BOOK Online now. Enjoy a fabulous day swimming and snorkeling around the famous Tangalooma Wrecks, Horseshoe Bay OR Amity Point. Experience the crystal blue waters and white sands of Moreton, Peel or Stradbroke Islands. BUY a Gift Card OR Book Online now. "Explore Our River Dinner Cruise". Our fantastic 2 hour dinner cruise is the perfect option for a group outing or a Corporate function. Please call our Fabulous Booking Crew on 07 3630 2666 to assist with your event. Our fantastic Brisbane River lunch cruise is the perfect option for a group outing or a Corporate function. Witness Brisbane's urban renewal projects and iconic landmarks from a River perspective.